Instead of doing random OOTD posts I decided to do a collective weekly outfits post on Friday for the next few weeks. Right now I'm planning on just doing it for the month of December (and this last Friday in November, obviously). This series isn't meant to be showcasing high fashion by any means. 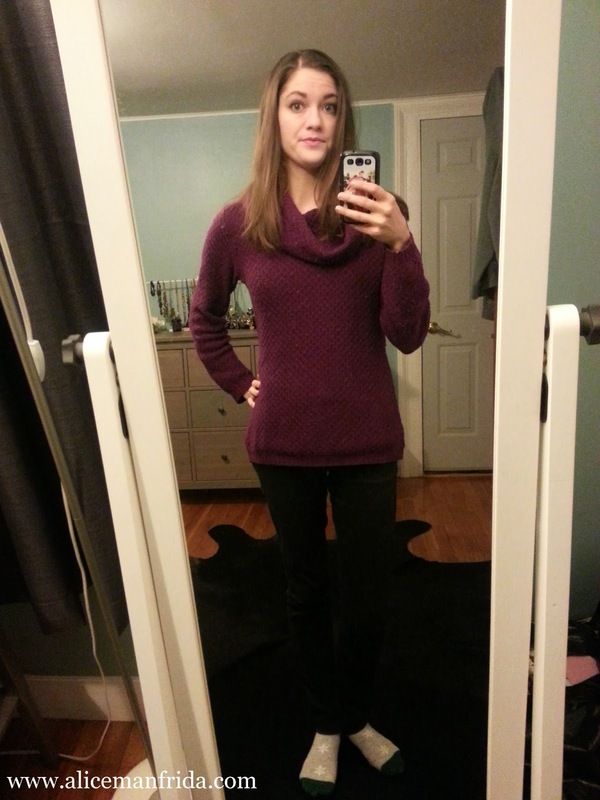 I'm just a regular woman wearing clothes in New England as the days get shorter and the weather gets grosser. :) Enjoy!! 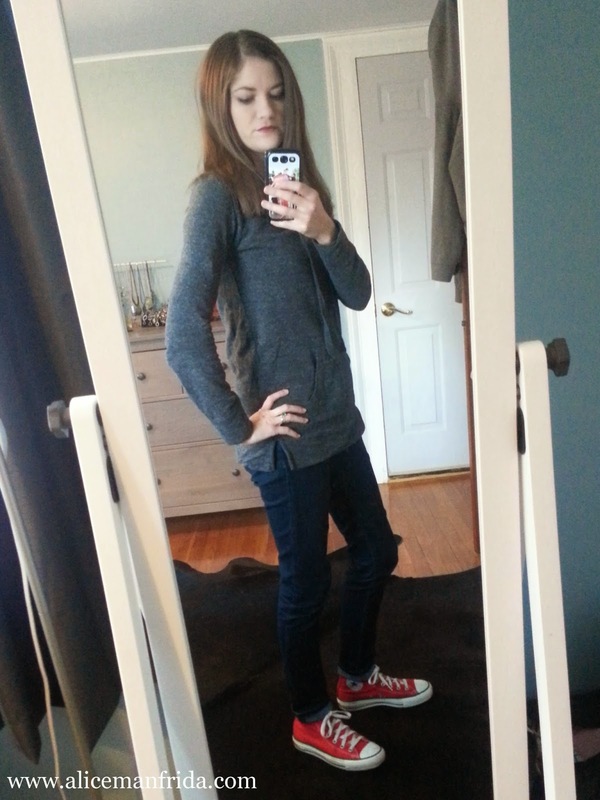 I wore a gray sweatshirt that my sister got for me at Loft a few years ago, dark skinny jeans rolled up and red high top Chucks. I kept it comfortable because I was heading out to the mall. This was a cold day so I had on a really warm sweater. It seems thin but it is actually really cozy. I really like the floppy cowl-neck because it kind of feels like I'm wearing a scarf. I paired it with black jeans, which I wear all the time. I don't know if you can tell from the picture but my socks have snowflakes on them. 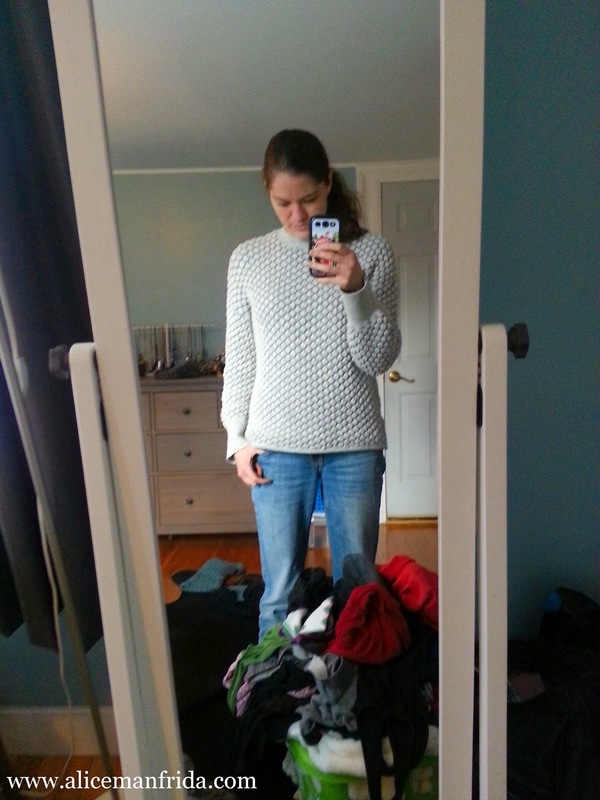 Here's that same sweatshirt from Loft! Ha ha! This was my staying-in-for-the-night look. I wore black leggings that I bought at Target probably 7 or 8 years ago and gray socks with white polka dots on them. 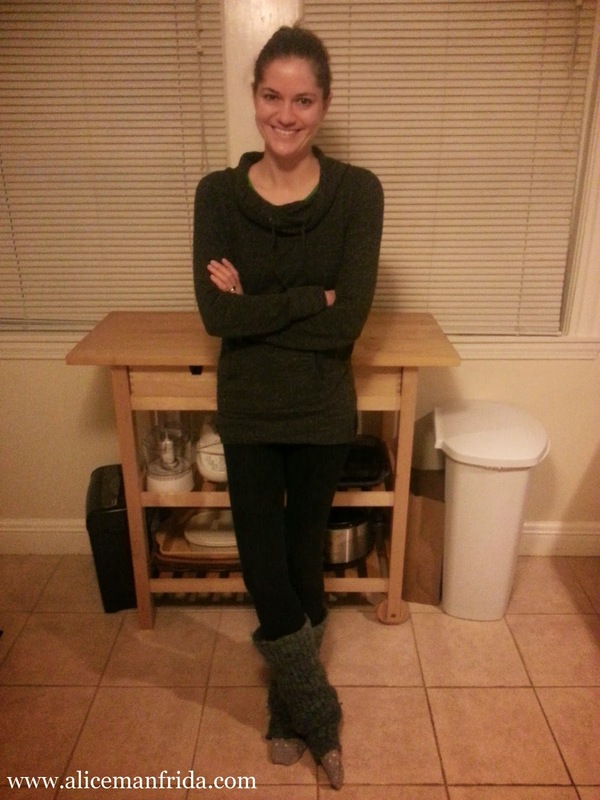 I also put on my giant fluffy legwarmers. My grandma knit them for me. It gets dark so early now so the lighting was terrible but the legwarmers are light blue and purple. What a gross day this was! It was humid and raining so I jumped in the shower as soon as I got home. 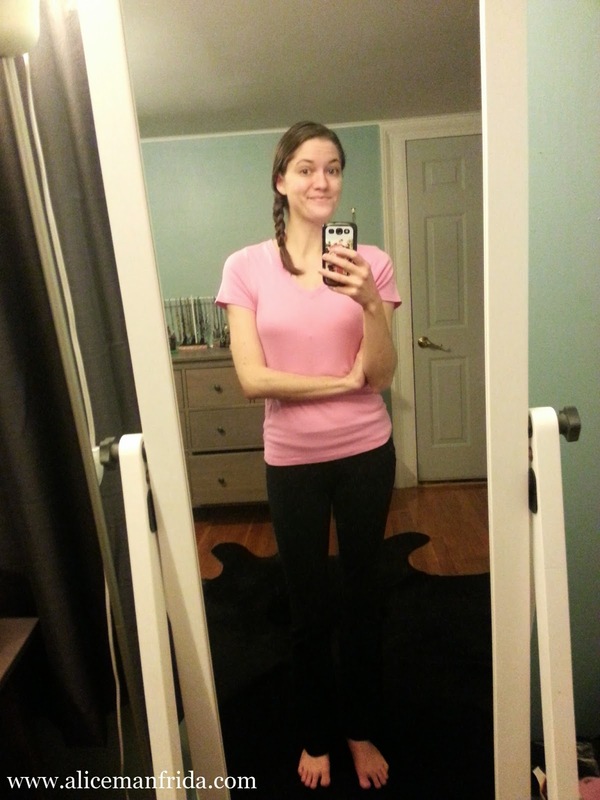 I put on sweatpants and a tee and was actually warm enough to stay that way. It was warm again today. I think it got up over 60°F! 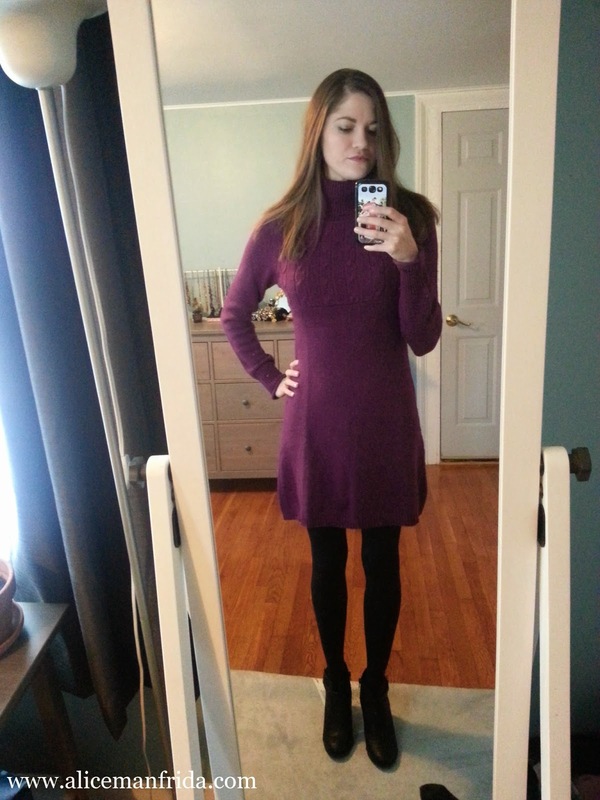 I wore a purple turtleneck sweater dress that was a hand-me-down from a friend with black tights and my new black booties. I rolled up my rug so that my legs and feet would actually show up in the picture but you can see better pictures of the shoes in my post from yesterday (here). I wanted to break in the shoes so I ran a few errands near where I live and I was basically sweating by the time I got home. Love the color of that second sweater!